Record and submit a 15-sec jingle for a chance to win a AUS$500 voucher. Submit your jingle to sales@hearthhouse.com.au by the 31st of October 2017. The jingle must be no more than 15 seconds in length, be no more than 500MB in size, and be submitted in one of the following formats: WebM Files, .MPG, .MPEG4, 3GPP, .MOV, .AVI, .MPEGPS, .WMV. or .FLV. 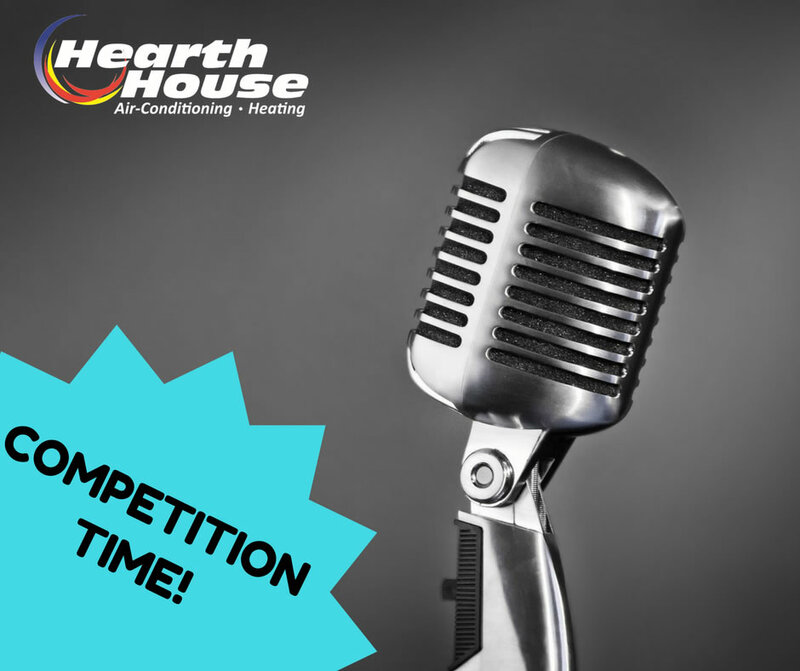 The Hearth House Jingle Competition (“Promotion”) begins on or about 12:00 PM AWST on 21/9/17 and ends at 11:59:59 AM AWST on 1/11/17 (“Promotion Period”). Record and submit a 15-sec jingle for a chance to win a $500 voucher. Submit your jingle to sales@hearthhouse.com.au by the 31st of October 2017. By submitting a jingle to sales@hearthhouse.com.au, Hearth House assumes the entrant has read and accepted these terms and conditions. Selection of first prize winner: One (1) first prize winner (“First Prize Winner”) will receive one First Prize, as defined below. The First Prize Winner will be notified on or about 2/11/17 via the email address submitted along with their entry. First prize: The First Prize Winner will receive one (1) five hundred dollar (AUS$500) Gift Voucher to be spent in any participating Hearth House store. Sponsor not responsible for any lost, stolen or damaged Gift Vouchers. All genres of music will be accepted. The jingle must include only individuals who perform the music and/or lyrics, including any background tracks. The entry cannot be owned in any part by a third party. The entrant in submitting the entry asserts that the entrant has sole or co-ownership to lawfully make such entry (entrant must own 100% of the publishing rights to the song). The competition is open to legal residents of Australia regardless of nationality or background. Hearth House reserves the sole and exclusive discretionary right to extend or restrict the entry deadline period. The jingle cannot include any visible logos, trademarks, or brand names (other than Hearth House). The jingle must not have been previously published or won any previous awards and/or contests; not include anyone with a current or pending recording, acting, modelling, or other performance-related contract. Entries will be screened by a Hearth House listening committee who will select the Winner. Jingles are judged equally on melody, composition, originality, and lyrics (when applicable). All prizes will be awarded to the primary contact (who emailed in the entry), and division of prizes among co-authors is the responsibility of winners. Entrant agrees to accept the final decision of Hearth House and its judges. Hearth House will use its best efforts to announce the winners at the designated time, but will not be held liable for any unforeseen delays. Winners will be notified by email, by phone or in person. Winners may be required to sign an affidavit confirming that winner’s song is original and he/she holds rights to the song. Failure or delay in signing and returning the form or Affidavit within a specified time period or provision of false information may result in the disqualification and an alternate winner being selected. Affidavits are subject to verification by Hearth House. Entry constitutes permission to use winner’s name, likeness, image and voice for future advertising and publicity purposes without additional compensation. The winning entrant agrees to unequivocally transfer all rights associated with the winning jingle royalty-free to Hearth House for use in all media and perpetual use and without any licence, charge or other form of payment accruing therefrom. Entrant agrees that should his/her jingles(s) be selected as a winner, Hearth House shall have the right to use the shortlisted jingle(s) for any and all promotional and/or related purposes. Entrant acknowledges that all songs entered may be distributed to judges who will be selecting the winners, and Entrant agrees to release, indemnify, and hold Hearth House, its sponsors, and judges harmless for liability, damages, or claims for injury or loss to any person or property relating to, in whole or in part, directly or indirectly, participation in campaign. By entering Hearth House’s Jingle Competition, entrants and/or their parents or legal guardian (if such entrant is a minor) agree to accept and be bound by the decisions of Hearth House and its judges which are final and binding in all matters. Entrant agrees to be bound by all terms of these official Hearth House Terms & Conditions as established herein. If and whenever required to do so, whether during or after the competition, the entrant shall, at the request and expense of Hearth House, do all things necessary, to execute such deeds and documents and provide all such assistance as Hearth House shall require to enable Hearth House to obtain and maintain the benefit of all Intellectual Property Rights and the entrant acknowledges that he/she shall not be entitled to any compensation in respect of the performance of his/her obligations hereunder. The entrant also agrees, to waive and hereby does waive any and all moral rights he or she has or may have in any copyright work in accordance with the Copyright and Related Rights Act, 2000, as amended. NO PURCHASE NECESSARY. INTERNET ACCESS AND A VALID E-MAIL ADDRESS ARE REQUIRED TO ENTER. Sponsor reserves the right, at Sponsor’s sole discretion, to substitute a Prize of equal or greater value in the event that any Prize is unavailable. The prize winner will be decided upon by a panel of judges from Hearth House whose decisions are final and binding in all respects to this Promotion. By entering this Promotion, all entrants agree to release, hold harmless and indemnify the Sponsor, its affiliates, subsidiaries, agencies, judges, and each of their respective shareholders, directors, officers, employees or representatives from and against any and all liability whatsoever for any injuries, losses, harm, damage (including but not limited to property damage, personal injury and/or death), claims, actions, costs and expenses (including without limitation, all attorneys’ fees and court costs) arising directly or indirectly from or in connection with any Prize or resulting from participation in this Promotion or from acceptance, possession or use/misuse of any Prize or participation in any Prize-related activity or use by Sponsor of the Vote in any manner. Submission of a jingle and acceptance of any Prize will constitute and signify the entrant’s agreement and consent that the Sponsor and/or the Sponsor’s assignees may use the entrant’s name, photograph, likeness and/or Prize information for promotional purposes in commerce and in all media worldwide now known or hereinafter invented without time limitation and without further compensation, except where prohibited. All Prize Winners are solely responsible for any local, state, or federal taxes on Prize received. Void where prohibited. Sponsor is not responsible for incorrect/inaccurate competition information. Sponsor reserves the right, in its sole discretion, to modify, terminate, or suspend the Promotion or void any Vote should a virus, bug, non-authorized human intervention, action of an entrant or other cause corrupt or impair the administration, security or fairness of the Hearth House Jingle Contest and/or this Promotion. If, for any reason, this Promotion is not capable of running as planned by any cause which, in the sole opinion of the Sponsor, corrupts or affects the administration, security, fairness, integrity, or proper conduct of this Promotion, or if due to any technical, production or other error, more Prizes are claimed or awarded than are described in these Official Rules at any Prize level, Sponsor reserves the right, at its sole discretion to cancel, terminate, modify or suspend this Promotion and determine the Winner(s) from Votes received prior to action taken, or as otherwise deemed fair and equitable by Sponsor. No more than the number of Prizes stated in these Official Rules will be awarded. SPONSOR: Hearth House, 28 Division Street, Welshpool, WA 6106, Australia.